This post marks the end of this year’s alphabet. I have found the exercise valuable and plan to begin again at A. Next year’s posts will probably be from a broad Quaker perspective and coloured by my formal appointment as an area meeting elder from 1.1.15 and as a member of the national Quaker Committee for Christian and Interfaith Relations from 1.5.15. They may also be enlivened by more photographs, since I have been given a digital camera for Christmas! יהוה is Hebrew and may be read as ‘yod hey vov hey’, it is normally rendered YHWH in English. Is it good to be young, or better to be more mature? 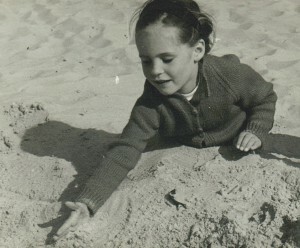 In my faith journey there are times I need to put away childish things, to lay aside images and notions that no longer serve. The image of God in the clouds, of Heaven as a distinct place. But I must also realise that I am replacing them with other images, other notions. God as a benevolent force, Heaven as a reality here and now. I have to be prepared to let these go too. There is a Buddhist story about a raft. The raft serves us well when we have a river to cross. But when we later come to a mountain that we must climb, we must abandon the raft which will only serve to hinder us. In my experience, I also need to reclaim childish things. Trust, the moments of total absorption in the present moment, the awareness of Presence. I need to strip away the layers of defences that I have learnt, that I have been taught, that help me cope with day to day life. I need to become vulnerable, to be open to the movings of the Spirit. My first Reiki initiation helped considerably in peeling away some of the layers, healing me. That was why I wept so much. Another phrase that has stayed with me recently is from David Amos writing in the Friend of 19 September: ‘People have told me that I am naive, which is not true. However, I am working very hard to get there.’ I think that is my aspiration too. Yearning, longing for something not quite attainable. 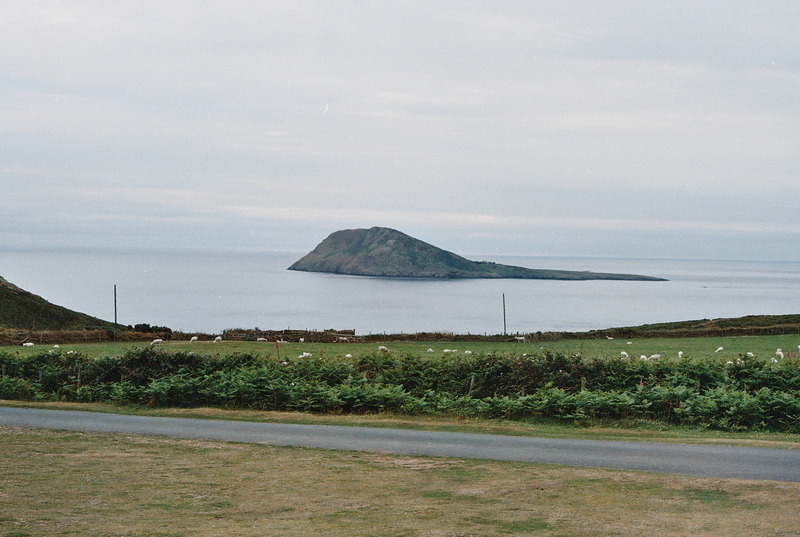 Yearning for Bardsey. In 2011 I went on holiday to the Lleyn peninsula with my spouse and my daughter. Like many tourists/pilgrims before us we followed the old pilgrim route along the north coast of the peninsula, stopping at various churches on the way and visiting lots of holy wells. 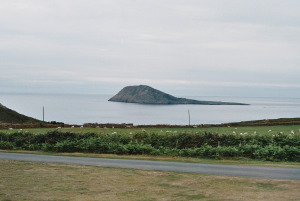 We ended at Aberdaron at the tip of the peninsula, and looked out to Bardsey Island. We telephoned the Bardsey boatman three days running, but the tides and sea conditions were not safe, and so we, like so many before us, could only yearn to go to Bardsey. It looks so tranquil and near at hand from the shore. In a more spiritual sense what I am yearning for? Those of us who are involved with more than one religious tradition are often accused of cherry-picking, only taking the pleasant bits from each tradition and not do the hard bits. Or of rushing round seeking spiritual highs all over the place. And yet the spiritual high, the awareness of being in the Presence, or just of being truly present in the present moment, isn’t achieved by rushing around, or even by trying hard. It’s there, right at hand. I need to just stop, just be, and be aware that I’m in the Kingdom, in the moment. Then maybe I stop yearning. 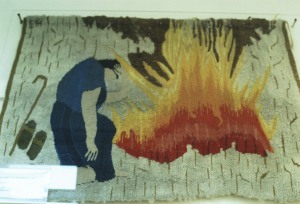 “Does the passage in which Moses meets God in the burning bush (Exodus 3:1-6) suggest that God had been there some time? Do you think God was waiting, longing perhaps, for someone, anyone, to stop, go over, and look at the wonderful sight? God may have lit the bush hours, days, weeks or years earlier. I wonder, if I had been there, would I have noticed the bush and would I have taken a closer look? It gave me a different perspective – is God yearning for us to stop, to notice, to be present? 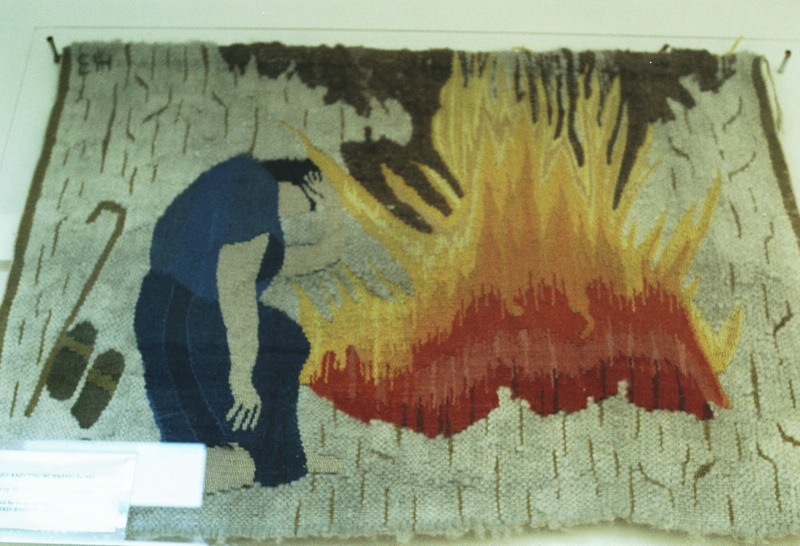 Would I be noticing my surroundings enough to see a burning bush if there was one? Or would I be rushing by, intent on the next thing I needed to do (however worthy that task may be) or yearning for something I believed to be unattainable, when all the while it was right here?